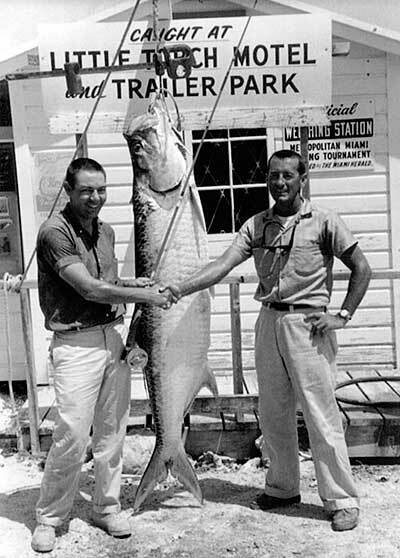 A 1961 photo of Mac Miller and George Hommell with Miller’s record 143-pound tarpon. Photo courtesy of Capt. Art Schmidt. ONE DAY IN MAY during the spring tarpon migration of 1961, George Hommell worked his boat and positioned his angler to make fly fishing history. In the shallow waters of Coupon Bight he put Mac Miller onto the tarpon of a lifetime. At 143 pounds it broke the 142-pound record set earlier that week by a client of the guide Roy Lowe. But a few days later, in the same waters, Stu Apte guided Joe Brooks to a fish that weighed in at 148 1/2-pounds. That tarpon beat Miller’s into the record books and, notably, the sports pages of the Miami Herald. Hommell didn’t get the press, but he is still one of the most influential figures in the history of Keys fly fishing. With our without the recognition and praise of peers, George Hommell Jr. would put his stamp on Keys flats fishing, tackle, and, not least, conservation. Hommell’s dad moved to Islamorada and Jr. followed after he got out of the service in 1945. Of course he took to fishing. “Down in the Keys there wasn’t much other to do,” he said. At that time fly fishing in the Keys was in its infancy. A handful of anglers had targeted snook and tarpon with bamboo fly rods, but for the most part finesse fishing meant using bait casting rigs to cast bait, lures and plugs to bonefish and tarpon. He figured it out enough to become a guide himself, taking to it full time in 1952. The one problem? “We didn’t have any customers back then,” said Hommell. There were the early die-hards like Brooks and Ted Williams, but easy travel to Florida, and especially the Keys, would not come until the expansion of commercial flight and the completion of the Interstate highway system. Most early clients in Islamorada came from the Miami Beach Rod and Reel Club. Through there, Hommell hooked up with the most loyal of clients in Mac Miller. Like many club members, Miller came from an affluent background—his father branded a famous shampoo in the 1940s—and had the money to spend many days on the water. Developments in tackle and technique helped them hook and land bonefish and tarpon with greater frequency. Monofilament fishing line, introduced by DuPont back in 1939, gained more mainstream acceptance. Fiberglass fly rods, introduced in the 40s, gave anglers better chances to handle big fish than bamboo rods. 3M introduced the first plastic coated fly line in 1954. Pflueger developed the 1498 and 1498.5 Medalist reels that had bigger capacity. “You could hold 230 of 30-lb. backing plus the fly line,” said Hommell. A charter captain from Miami named Bob “Mac” McChristian started a machine shop to build Seamaster reels, designed specifically to hold up to saltwater use. With engineering help from the famous boat builder Gar Wood, Fin-Nor developed its “Wedding Cake” reels. And Jimmy Albright created the Albright knot, a key development in connecting lines of different diameter to construct a more heavy-duty leader. Hommell helped refine the techniques for poling for bonefish and contributed shrimp fly patterns, including one of the first bead-eye flies, called the Hommell Evil Eye. Another important thing Hommell did was trailer his boat. When the fish were elsewhere in the Keys he’d get his clients on them. “He’d drive 60 miles from Islamorada to Little Torch Key and launch before daybreak to be first on the better tarpon spots,” recalled Stu Apte. At the time Apte, who lived on Torch Key, was just breaking into the guiding game and didn’t have many bookings. “I’d call George and he’d bring down a client along with Jack Brothers and a client, and he’d bring a client for me. And I’d tell him where I’d been finding the fish.” Apte, of course, is one of the anglers most responsible for developing the techniques for quickly subduing tarpon with a fly rod. And it was far from Islamorada when, during that May of 1961, Roy Lowe, Hommell, and Apte guided clients to record fish in the same week. A tarpon in the 140 pound class is nobody’s fool. It’s a female fish with decades of life experience. Landing one with today’s fly tackle is an achievement; landing one with 1960s gear was monumental, but as that week in Coupon Bight illustrated, possible. When Mac Miller passed away in 2008, he left all his old tackle to Art Schmidt, including the rod and reel he used to catch his record tarpon in 1961: a Seamaster reel and a Heddon fiberglass rod with a fast action tip. “The thing weighs a ton compared to nowadays,” said Schmidt. Miller and Hommell’s record would have lasted a lot longer if not for a fortuitous misstep by Joe Brooks. “Mac told me that Joe was going to fish a bamboo rod that day,” said Schmidt. “But he stepped on it.” So he used one of Apte’s fiberglass rods instead. Miller and Joe Brooks no doubt talked about it at the Green Turtle Inn, then the center of the Islamorada social scene. “They’d fish all day and have cocktails there at night,” said Schmidt. Most of the regular anglers and guides knew each other. Hommell and Ted Williams were neighbors and became good friends. “We traveled to Belize, Costa Rica; every year we went someplace,” recalled Hommell. It was Ted Williams, who came up with the idea for the Gold Cup Tarpon Tournament, first held in 1964 with help from Hommell, Jack Brothers and others. Hommell posted seven releases in the 1964 Gold Cup, and made a name for himself as a tournament guide in later years, guiding the Grand Champion in the Islamorada Invitational Bonefish Tournament in 1971, 1972, and 1974. In 1975 he guided Flip Pallot to victory in the first Islamorada Invitational Fall Fly Tournament. These wins further cemented Hommell’s reputation as a top guide. He already had a loyal following, known as one of the most pleasant guides to spend a day with on the water. Hommell’s skill and demeanor helped him land one of the biggest clients a guide can have, the President of the United States. Hommell counts the 41st president, George H. W. Bush, as a friend. “I guided him when he was V.P. elect,” said Hommell. When Bush was the President-elect in 1989, Hommell guided him to a 13-pound bonefish, earning a write-up by Maureen Dowd in The New York Times. But for all of Hommell’s work on the water, he is probably more known for what he’s done off of it — most notably that little tackle shop at mile marker 81.5. Billy Pate is one of the most accomplished anglers of all time, setting a fly rod record with a 188-pound tarpon in 1983 and catching marlin and other giant fish on fly all over the world. But in the early 1960s he was trying to figure out flats fishing in the Keys and hired George Hommell as his guide. Hommell also struck up a friendship with Carl Navarre, an angler who made a fortune as a Coca-Cola bottler. In 1967, the three of them founded World Wide Sportsman. “The people who’d been fishing here didn’t have a place to buy fly tackle,” said Sandy Moret. Now they did. Worldwide sold all kinds of tackle, but it was more than just a tackle shop. It had a travel agency that helped anglers get to exotic fishing destinations all over the world. Guides who kept their skiffs at the attached Bayside Marina also staffed the store. They could teach people how to use what they were buying. Hommell and Pate kept a CB radio on in the shop to pass along information. Hommell, who ran the store on a day-to-day basis, had a huge impact on making saltwater fly fishing more accessible, and in making a tackle shop a business. “If I had one place I modeled my shop after it’s Worldwide,” said Gary Merriman, owner of The Fishhawk in Atlanta, who has been fishing the Keys since 1973. As it turned out, the store also became responsible for a major advancement in fly reels. In the early 1970s, the Fin-Nor and Seamaster reels were still the best available for fighting big fish. But they weren’t easy to buy. “You almost had to bribe Captain Mac to get one,” said Merriman of the Seamasters, still made by Bob McChristian in his Miami shop. In his book Bluewater Fly Fishing , Trey Combs wrote that the scarcity of Seamasters led Hommell and Pate to approach a machinist named Ted Juracsik about building a reel based on some of Pate’s concepts. In 1976, Juracsik came back with the Billy Pate Reel. And for a while Worldwide Sportsman was the only shop in the country to carry it. Worldwide Sportsman became an institution, and a stop for anglers fishing in Islamorada or passing through to the lower Keys. Hommell and Pate sold the store to Bass Pro Shops, which reopened it as it exists today in 1997. It has become a tourist destination, drawing thousands of visitors a day during the peak season. In the early days, guides killed a lot of their catch so that clients could keep trophies, or to show off at the dock to drum up business. In the 50s and early 60s, with relatively few anglers and a seemingly undented population of fish, they didn’t think to much of it. But that changed when the guides notice their catches start to decline. In the 1970s, the Islamorada Fishing Guides Association (now the Florida Keys Fishing Guide Association), of which Hommell was a prominent member, became one of the first groups to promote the catch and release ethic, and to push the idea through the tournaments. The guides also noticed a rapid degradation of the Everglades and Florida Bay. Billy Pate, Stu Apte, Rick Ruoff and others spearheaded the Everglades Protection Association, and Hommell contributed to the cause of tarpon and bonefish protection and Everglades restoration by promoting them through Worldwide Sportsman. He was also a pioneer in “green.” In 2000, Bayside Marina became the first recognized by the Florida DEP under its new “Clean Marina” program, designed to help owner maintain more eco-friendly marinas and boat yards. Hommell is also a founding member of Bonefish and Tarpon unlimited, now The Bonefish and Tarpon Trust. “We all realized the fishing was going down so we had to do something,” said Hommell, “to make sure it didn’t get too far down and hopefully even increase.” Today the BTT is leading the way in scientific research and catch and release ethics for bonefish, tarpon, and permit on an international level. The tarpon mount still graces World Wide Sportsman with its presence. And most days, so does George.